A low-oxalate diet can help prevent kidney stones, which are caused by a buildup of minerals in your urine. Kidney stones, when they get large, are extremely painful and may cause urinary blockage. Meanwhile flaxseed is rich in omega-3 fatty acids that promote general and heart health. If you use flaxseed for health purposes, you likely won't have to give it up when following a low-oxalate diet. Some kidney stones are made up of calcium oxalate. When this is the case, avoiding high-oxalate foods can help you prevent stones. Such foods include black tea, soy products like milk and cheese, nuts, sesame seeds, wheat germ, chocolate, a variety of fruits including blackberries and blueberries and some vegetables including beets, carrots and celery. While many nuts and seeds are in the high-oxalate category, flaxseed is in the low- to moderate-oxalate group of foods. That means they contain between 2 and 10 mg oxalate per serving. A 1-tbsp. 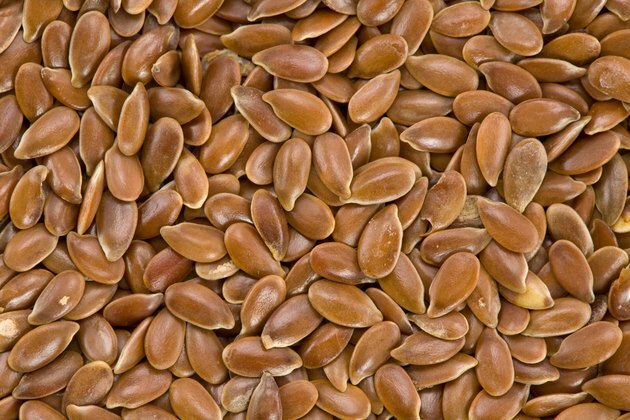 serving of flaxseed has 37 calories, about 3 g fat, 1.3 g protein and 2 g carbohydrate. When you are restricting oxalates, you consume no more than two to three servings of moderate oxalate foods daily, according to University of Pittsburgh Medical Center. Other moderate oxalate foods include orange and carrot juices; yogurt; brown rice; bagels; numerous fruits, including strawberries and pears; corn tortillas; white bread; and numerous veggies, including lettuce, onions, tomatoes and broccoli. Flaxseed is a rich source of alpha-linolenic acid. An essential omega-3 fatty acid, ALA appears to provide benefits for lowering cholesterol and reducing risk for heart disease, according to University of Maryland Medical Center. It also may be beneficial for arthritis, inflammatory bowel disease and other health problems including ulcers, psoriasis and glaucoma, though more research is needed, experts at UMMC note. A typical therapeutic dose is 1 tbsp. ground flaxseed three to four times daily consumed with plenty of water. Alternately, take one to two capsules of flax oil daily, or 1 to 2 tbsps. of flax oil. USDA Nutrient Database: Flaxseed, Ground, 1 Tbsp.